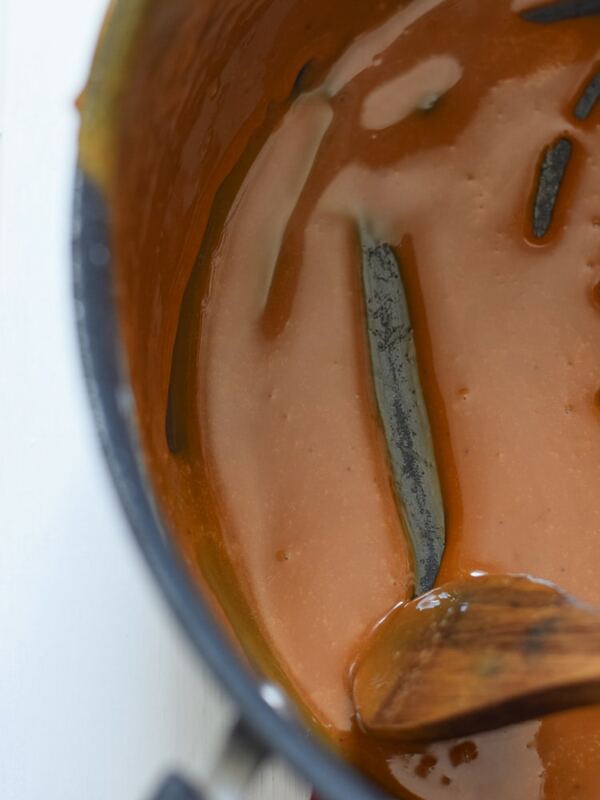 This Easy Cajeta (Mexican Caramel) recipe is made with only 5 ingredients and is easy to make. It makes a perfect topping for any dessert. 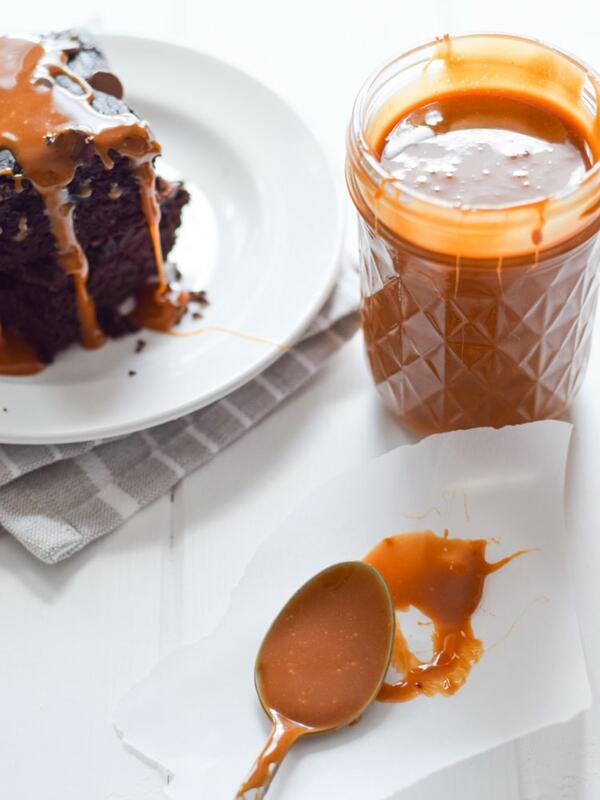 If you like dulce de leche, you’re going to love cajeta! That’s how it all got started. I said those words and John immediately shook his head in agreement. More often than not, we like to end our dinner with a little something sweet around here. But because dessert is a normal, everyday thing, it’s usually very low key. Nothing fancy – a handful of chocolate chips, some fresh fruit (fresh cherries are my favorite right now), a scoop of ice cream, a piece or two of hard candy – whatever we have in the house. Nothing crazy. Just a touch of sweet. But when I actually make dessert from scratch, it’s a different story. Now I’m not a baker. For some reason, baked goods and treats always take me about three tries to get just right. That or I give up (and I’ve given up quite a bit). I don’t throw around the word “easy” when it comes to dessert very often, because it’s not usually very easy for me. But when it is, I like to tell everyone about it. Like right now. This post. This recipe. SO EASY! This cajeta recipe requires only five ingredients, a big pot, a wooden spoon and a stove. What the heck is cajeta, anyway? 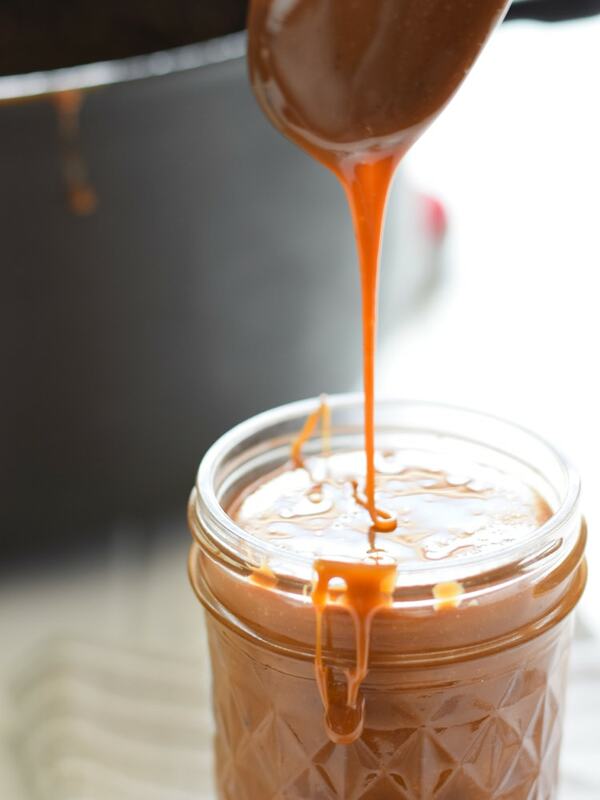 Sometimes known as Mexican caramel, cajeta is a sticky, gooey caramel-like sauce that’s made by heating and caramelizing a pot of goat’s milk and sugar until it reduces to a beautiful golden brown color. The goat’s milk gives it a rich and complex flavor that you won’t be able to stop eating. I know from first-hand experience. It’s VERY similar to dulce de leche. In fact, they’re made the exact same way except dulce de leche uses cow’s milk. 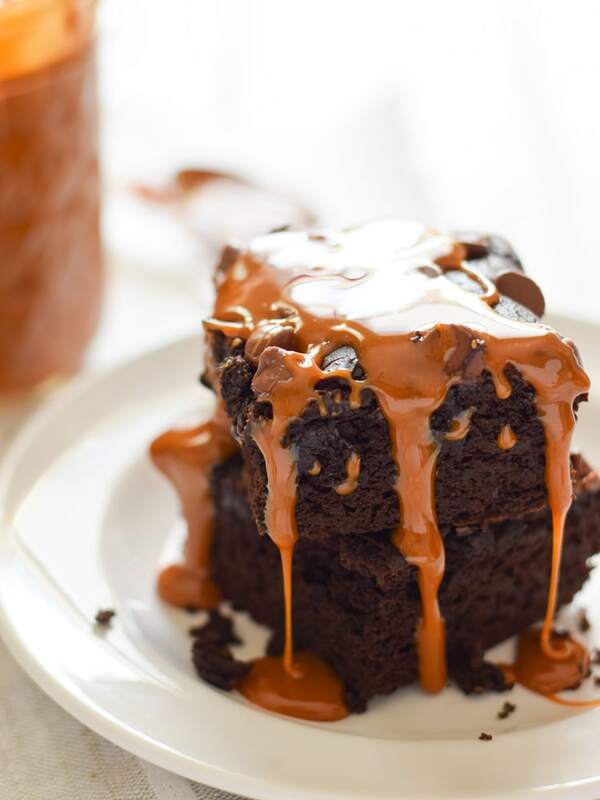 So if your tummy is sensitive to cow’s milk, this dessert sauce is calling your name! Mexican. Caramel. My mouth starts watering just thinking about it. The brownies you see in this post? They’re pretty damn good. AND they’re made with beans (yes, beans!) which means they’re “healthier” which means they deserve an extra drizzle of cajeta. It’s only fair. 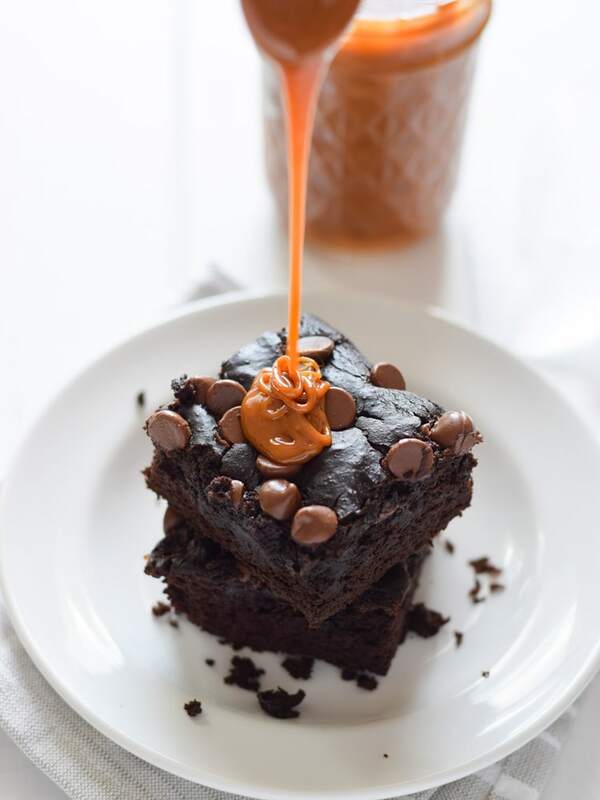 Grab the recipe for these Black Bean Blender Brownies here. In addition to being easy to make, cajeta is also extremely versatile. Take a look at this list of ideas on how you can eat it! In a small cup, mix 3 tablespoons of goats milk with baking soda. Set aside. Place the sugar, cinnamon stick and remaining milk in a Dutch oven or large pot over medium to medium-high heat. Bring the mixture to a simmer, stirring frequently to dissolve the sugar. Once simmering, remove the pot from the heat and add in the dissolved baking soda and goats milk. The mixture will froth up quickly, almost doubling in volume. Once the mixture stops bubbling, return the pot to the heat and bring it back to a simmer. Cook until the mixture has reduced and thickened (about 45-60 minutes). Be sure to stir frequently, scraping the bottom of the pot so it doesn't burn. The cajeta is done when you can scrape the mixture aside and see the bottom of the pot. It should be thick like honey. 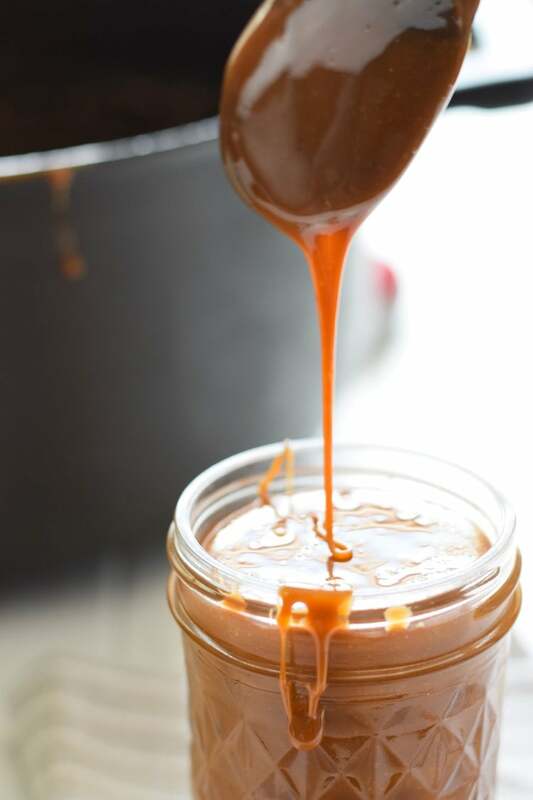 To store, pour the cajeta into a glass jar and let cool. Cover and store in the fridge for up to two weeks. The cajeta will thicken once it cools. To soften it, heat it up in the microwave a few seconds at a time or run it under hot water. Recipe adapted from Rick Bayless. Hubs brought in the milk from the goats and I.strained.it.a d pit it in the crockpot for the night on high and went to bed. In the morning I found brown colored cheese. Which is funny, because I messed up my crockpot yogurt before and came up with something distinctly caramel-like in smell and texture, if not color. I had added the yogurt culture too soon and the temp was too high and killed it. Ah well, the milk was going to go to pigs, anyway, I was just seeing if I could make something with it first. Do you use goat’s milk from the dairy section or canned evaporated goat’s milk? I used fresh goat milk from the dairy section, not canned and evaporated. Amazingly easy and delicious. Made some today serve with my Churros………..Can’t wait to serve it to everyone. For the most incredible fudge you have ever tasted, try mixing ≈ equal parts Cajeta and Nutella. Stir for 20-30 seconds until the mixture cleans the sides of the bowl. Make as little or as much as you would like. Great for a kid’s recipe. No heat or things that can hurt them. Do not use anything other than goat’s milk Cajeta, or it will not work. That sounds delicious! I’m definitely going to try this! If it turns out well, I may just post it on the website. Thanks so much! I just made this and it was delicious!! I grew up eating cajeta but now live in Canada and hadn’t had in years. You’re right, it’s SO EASY to make. I halved the sugar and it still worked and tasted awesome. I made ice cream sundays and almost finished the whole thing in one go. That’s the best sign of a good recipe. Thank you! Can I use canned evaporated goat’s milk for this recipe? I’ve made this recipe several times and I love it. And for the person who asked, I use raw goat milk for this………..the heating is what ‘pasteurizes’ it so anything you make where you heat it to boiling or just below – yogurt, ricotta, cajeta, it will be pasteurized. I don’t usually worry about the pasteurization for most things, I know how I am handling the milk so I feel safe in using it. My first attempt and I LOVE it!!!! Used raw goats milk. Do you keep the cinnamon stick in for the entire time? I took it out before it got thick. Hi Meg, what you did is totally okay. By that point, it should have infused lots of the cinnamony goodness. 🙂 I think I left it in the entire time, but it doesn’t really matter. I’ve been trying to find an easy stovetop cajeta recipe for my Nigerian dwarf goat milk. This was perfect – so good w apple slices! Only fancy because it has the highest percentage of butterfat of any dairy goat. We now make this recipe every week! Yum!! Yay! I’m so glad you like it! It’s sooo addictive, haha. Straight from the goat to the stove. WOWzers is this good! At what point do you remove the cinnamon stick? I left the cinnamon stick in the entire time and just removed it at the very end, but you can remove it once it starts to really thicken up. Can you use raw milk in this? I think you can, but I’m not sure. I’ve only used pasteurized. I just made this and it is absolutely wonderful! Now I have something to do with all my goat milk. Woo! Isn’t it addicting? You’re making me want to make another batch right now, haha. Is it raw goat milk or pasteurized? I’m trying to find in my area and the a couple places say I have a choice between raw or pasteurized. Woah. I want to go swimming in a giant swimming pool (hot tub?) full of this stuff! 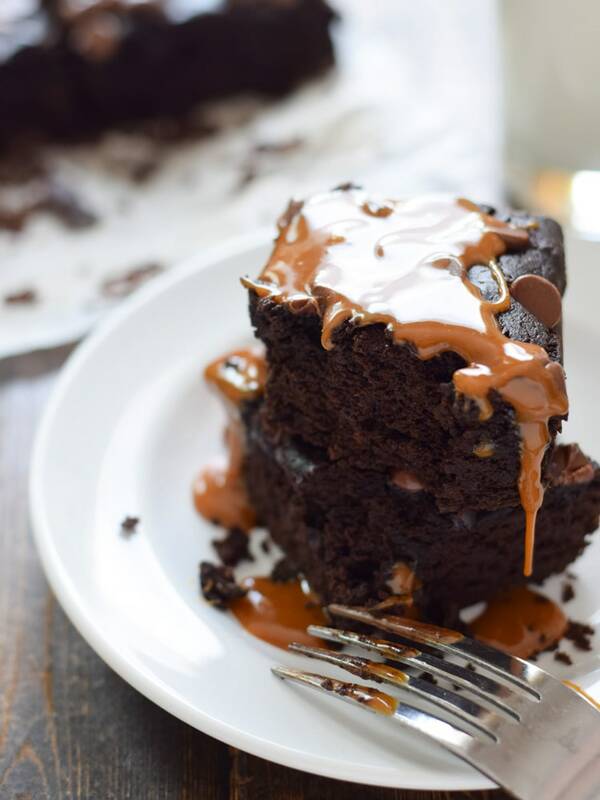 Looks so good and would take any dessert to the next level! Yum! Absolutely perfect. I included this in my Friday links roundup! Oh my heavens! This looks divine!!! Thank you! If you can believe it, it tastes EVEN BETTER!